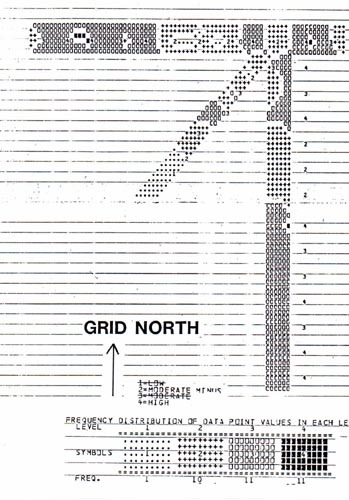 Approximately 100 soil samples were taken at 23SL220 during the Spring of 1981 to determine if there were concentrations of Orthophosphate (P2O5) and/or carbonized wood material on the ridge North of the Thornhill Plantation home. Orthophosphate is a natural byproduct of human and animal waste. The assumption is that Orthophosphate will be elevated around domestic structures and at places used as a latrine. Soil samples were augered from below the plowzone along three transects. Soil samples were taken at 10 meter intervals along each transect. 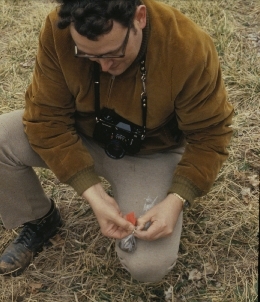 Samples were tested in the field. 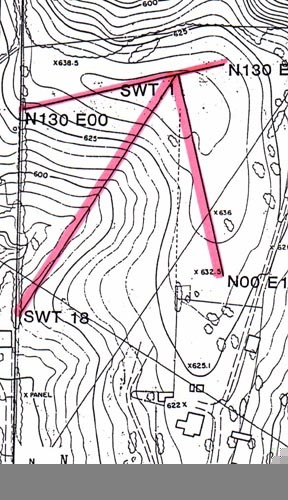 Plan of the North transect, East-West Transect, and Southwest transect relative to the natural contours of the ridge, Spring 1981. Map generated with SYMAP program showing presence/absence of wood charcoal in the three transects studied at 23SL220 during the Spring of 1981. 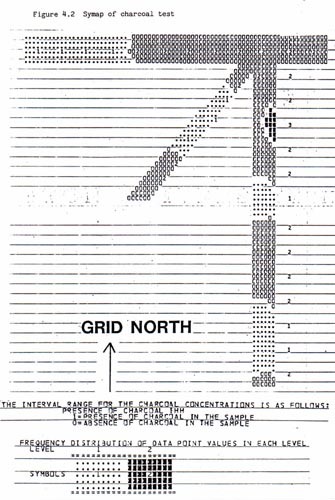 Map generated with SYMAP computer program showing High, Medium, Low and null for Orthophosphate (P2O5) concentrations at 23SL220 during the Spring of 1981. 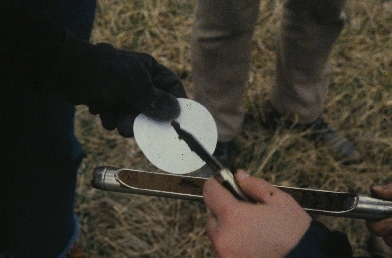 Image of the testing of orthophosphate intensity of a soil sample. The soil samples were removed with a slip auger. 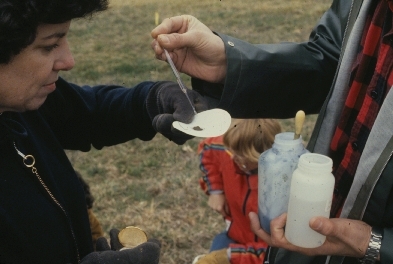 Image of Diana Blanchard assists in the chemical testing of a soil sample. Neathery Batsell (Fuller), in background, removes another sample for testing. 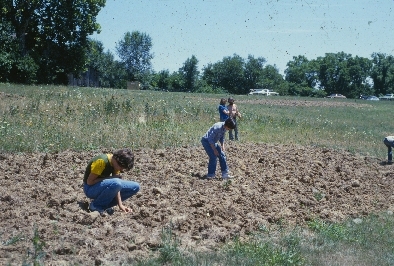 Image of the field testing for orthophosphate required two chemicals applied to the soil sample. The intensity of blue expressed on the surface of a piece of filter paper is indicative of the content of orthophosphate. 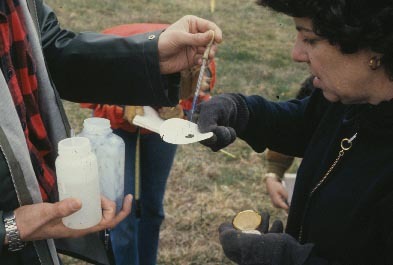 Image of the soil testing at 23SL2300. 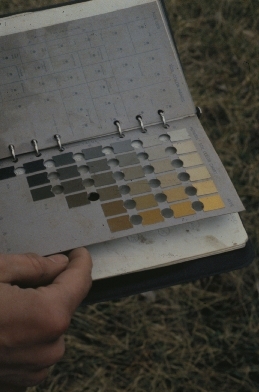 The color of each soil sample taken at 23SL220 was recorded using a Munsell Soil color chart. It was possible that shifts in the hue of the soil could be a clue to the type or intensity or occupation. 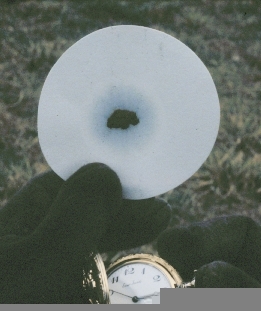 Image of Michael Fuller's pocket watch being used to measure exactly 2 minutes. The evaluation of orthophosphate intensity would be made after 2 minutes of chemical reaction between two solvents and the soil sample. The darker the blue hallo around the soil sample, then the higher the orthophosphate concentration. Image of Haskins pushing and pulling the slip auger at 23SL220. Everyone has to learn how to use tools like trowels, augers, munsell charts. Valerie would go on to work with Neathery and Michael Fuller in Jordan on the skeletons buried in Roman tombs. She is currently conducting research with the Smithsonian Institution. 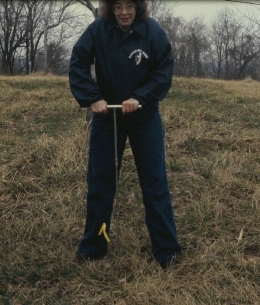 Image of Washington University student taking soil samples in the small valley running southwest from the hilltop overlooking the Missouri River. 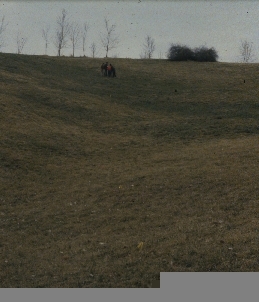 Changes in landuse practice by St. Louis County Park Department has allowed this grassy hill to become covered with scrub oak and weeds by 2001.